Feb. 13, 2008: On Wednesday evening, February 20th, the full Moon over the Americas will turn a delightful shade of red and possibly turquoise, too. 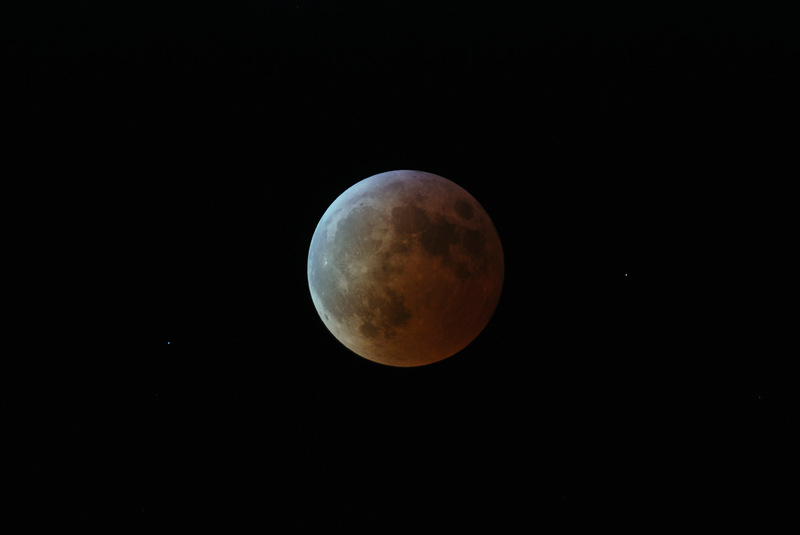 It's a total lunar eclipseâ€”the last one until Dec. 2010. Above: A preview of the Feb. 20th lunar eclipse created by graphic artist Larry Koehn. Click on the links to view labels for other time zones: GMT, AST, EST, CST, MST, PST, Alaska, Hawaii. Consider the following: Most shadows we're familiar with are black or gray; step outside on a sunny day and look at your own. Earth's shadow is different because, unlike you, Earth has an atmosphere. The delicate layer of dusty air surrounding our planet reddens and redirects the light of the sun, filling the dark behind Earth with a sunset-red glow. The exact tint--anything from bright orange to blood red is possible--depends on the unpredictable state of the atmosphere at the time of the eclipse. "Only the shadow knows," says astronomer Jack Horkheimer of the Miami Space Transit Planetarium. Transiting the shadow's core takes about an hour. 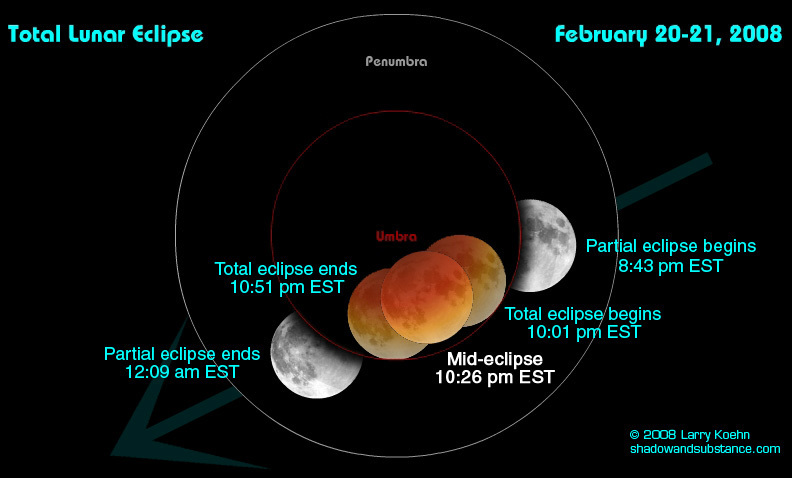 The first hints of red appear around 10 pm EST (7 pm PST), heralding a profusion of coppery hues that roll across the Moon's surface enveloping every crater, mountain and moon rock, only to fade away again after 11 pm EST (8 pm PST). No special filter or telescope is required to see this spectacular event. It is a bright and leisurely display visible from cities and countryside alike. "The blue and turquoise shades at the edge of Earth's shadow were incredible," recalls amateur astronomer Eva Seidenfaden of Trier, Germany, who took the picture at right during the European lunar eclipse of March 3-4, 2007. Dozens of other photographers have documented the same phenomenon. Blood red, bright orange, gentle turquoise: it's all good. Mark your calendar in vivid color for the Feb. 20th lunar eclipse. Editor's note: This story is written for an American audience, but not only Americans can see the eclipse. People in Europe and western Africa are also favored. International maps and timetables may be found here. Eclipse visibility map -- sky watchers in the Americas, Europe, and parts of western Africa can observe the eclipse.